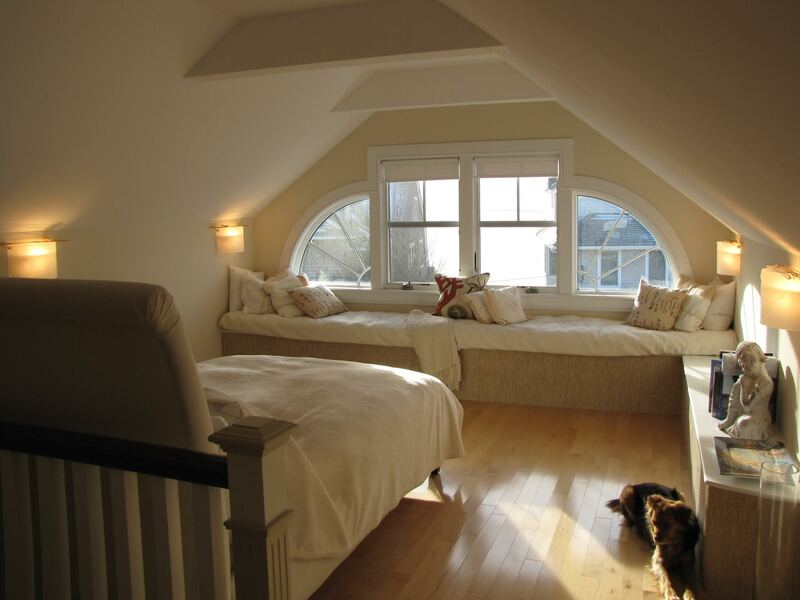 Cathy renovated a 1950’s beach house in New London, Connecticut, into her dream home with a considerable amount of custom work throughout. 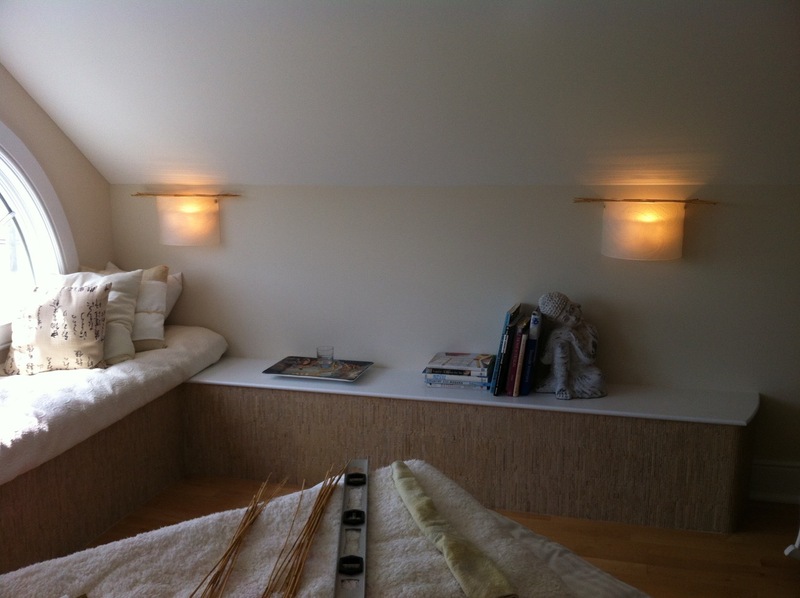 I was very hands-on in the project, creating “Bamboo Moon” and wall sconces for the master bedroom, as well as landscape design support to transform the bare yard to a garden of delight! 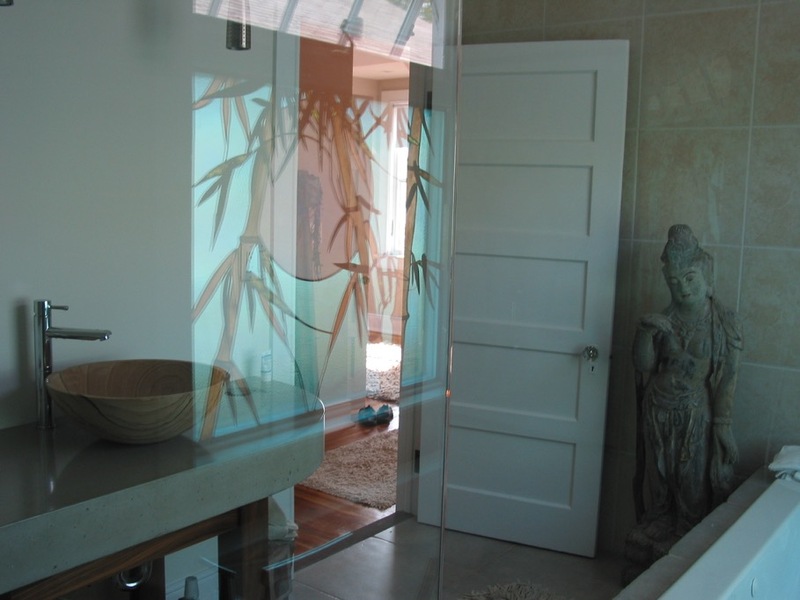 “Bamboo Moon” was designed to create a sense of peaceful tranquility in the master bath. The challenge was to discover the perfect palette of glass that would bring together the colors and textures in the master suite. The colors needed to be light enough to glow in a soft northern exposure, and opaque enough to give privacy from the neighbors house, just fifteen feet away. 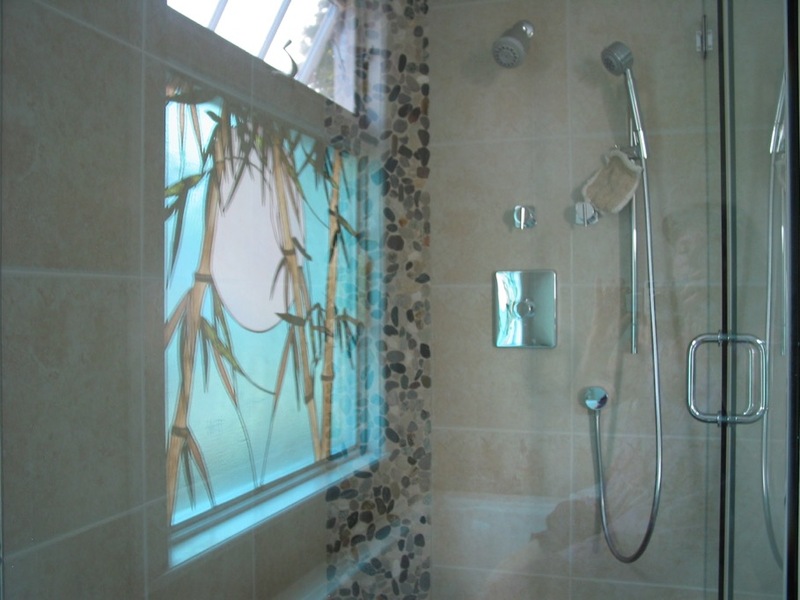 “Bamboo Moon” was made to fit exactly into the existing window above the bath. We choose an iridescent glass that is very subtly alive as the light of day changes, and is radically different at night when interior lights are on. Cathy also wanted something with depth and dimension. 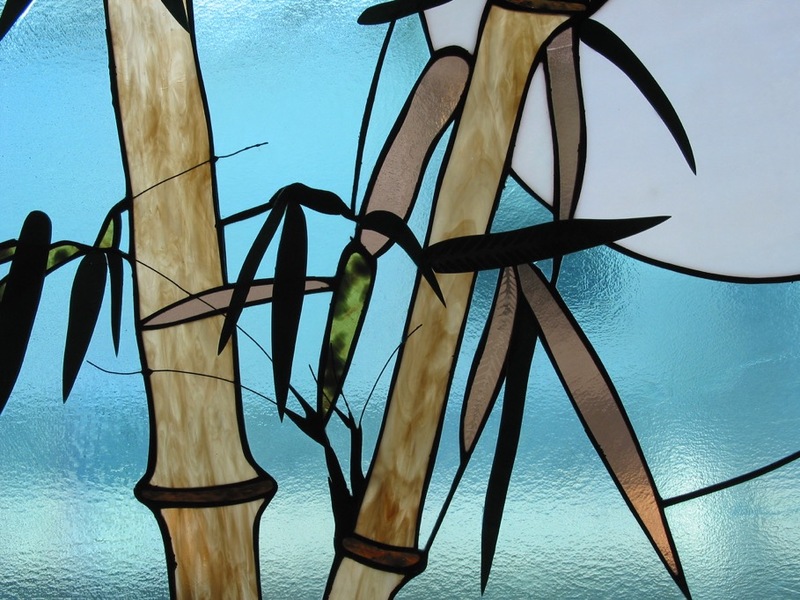 I created that feeling by having many layers of leaves in the bamboo, so in places glass leaves are mounted on other leaves, creating a canopy. The many challenges to design and make something to transform the bathroom into a spa sanctuary could only be achieved with a custom made original work of art! The collaboration was directly between myself and Cathy. It started with a simple open-ended-dreaming-out-loud conversation to discover the feeling she wanted to have while lying in her jacuzzi, and a guided visualization to tease out details that could inform the design. 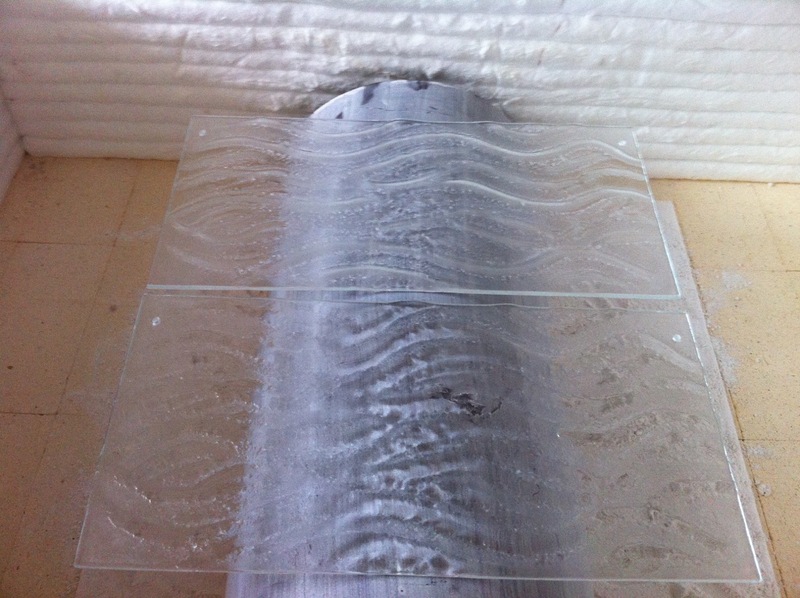 We had several studio and site visits to select the appropriate glass for the project. This was vital, as she is also a painter with a great sensitivity to the subtlety of color and how it would bring together the neutral colors of the tile and stone in the bath with the colorful paintings in the bedroom. Once we agreed on the theme of bamboo, the qualities of peace and tranquility, and the color palette, Cathy gave me free reign to create something spectacular for her. I gave her occasional updates with pictures of the work in progress. She came for a studio visit as it was nearing completion, and burst into tears when she saw it. It was more beautiful than she had imagined. 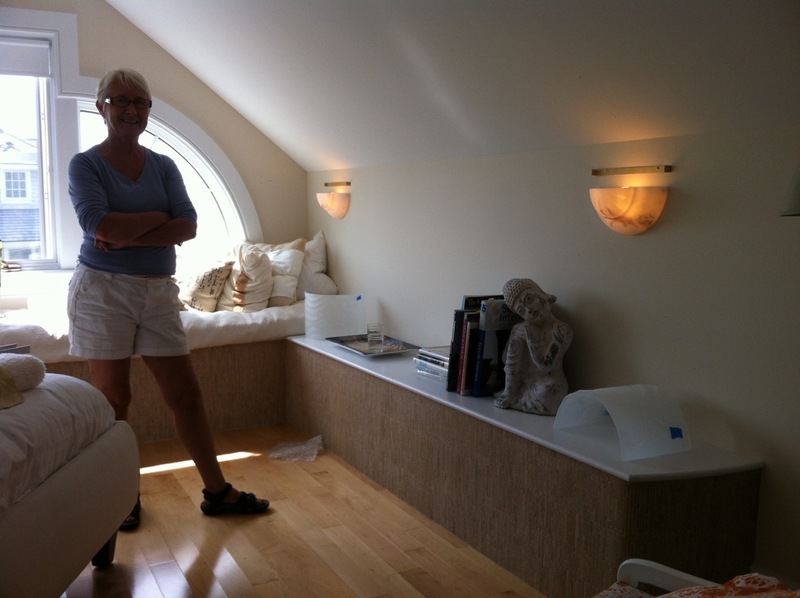 Cathy had installed manufactured wall sconces, but given their location and the slope of the low ceiling the bulbs were visible, eliminating any intimate ambiance in the master bedroom. She asked me to create a clear glass facade to mount over the existing sconces. Thick pieces of clear glass were textured by kiln-firing at a very high temperature to create the feeling of undulating waves and sandy beaches, then slumped from flat to a half circle. Holes were drilled and a special metal bracket for hanging was custom-made. 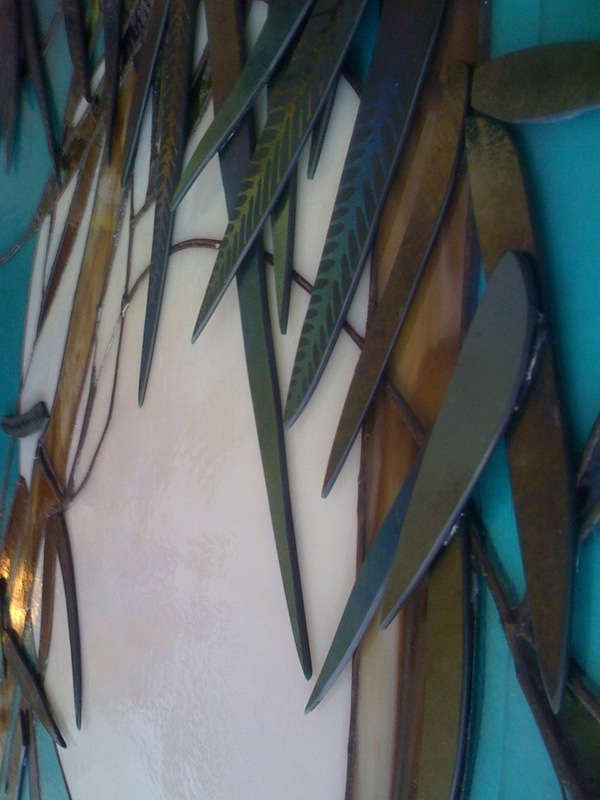 I mounted the glass pieces over the existing sconces and they are beautiful in the light of day and at night! 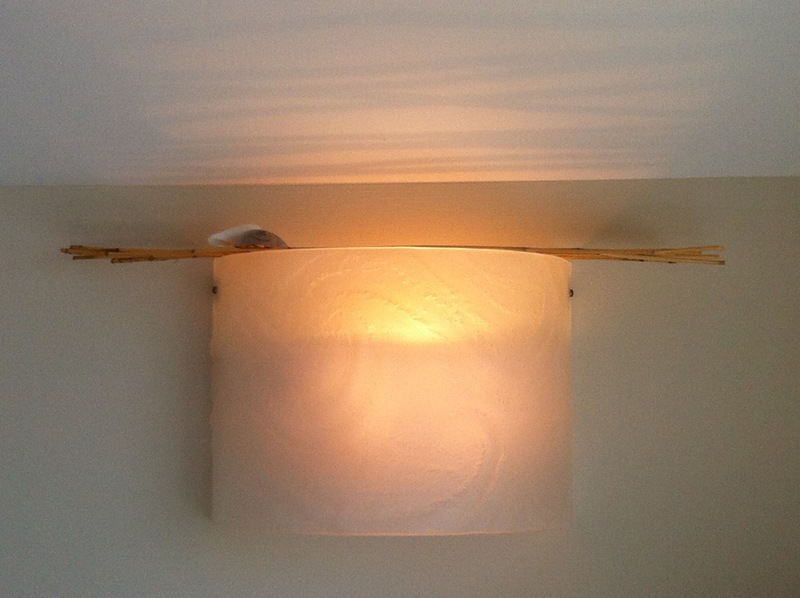 When illuminated from behind, the existing sconce creates a horizon line, and small thin pieces of bamboo on the top act as a diffusor, filtering light and casting unique shadows on the walls and ceiling. Next, we are going to transform the basement into a spa room and we’ll be designing more sconces to create the perfect spa ambiance! Eileen was amazing to work with. At once she understood the sense of peace and serenity that I was trying to achieve in the master bath and in particular how I wanted it to feel like a spa–a place to relax and wash away the intensity of my work world. Using guided imagery techniques she presented me with various ideas and motifs for a stained glass window above the jacuzi and in the process we chose bamboo as a theme. 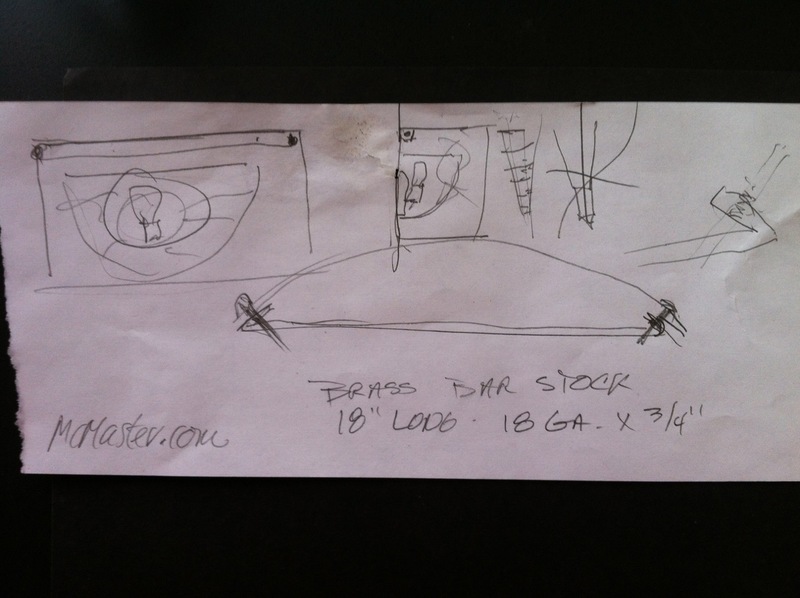 Over the next week she sent me several designs for consideration. As soon as I saw “Bamboo Moon” I knew that was the one. It was elegant, peaceful, and beautiful. As a painter, color was important to me. Eileen suggested iridescent glass as a way to create an alive, transformative feeling with color since during the day the light from outside would shine through but at night the light from inside would reflect off the glass. She brought me several samples of glass to look at in shades of teal, ivy, forest green, blue, silver, brown, and gold. We agreed that the teal, ivy, forest green and brown would be perfect as they complemented the color of the tiles. 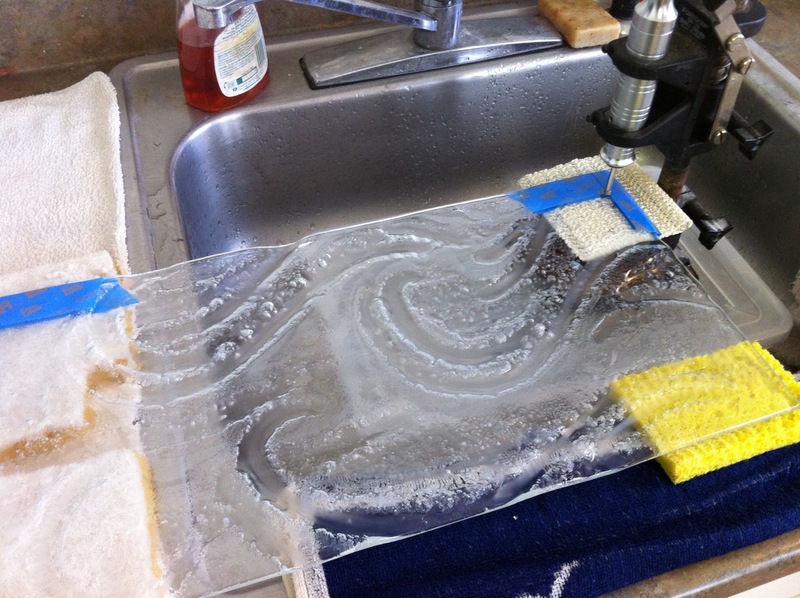 Choosing the background glass for the piece was no easy feat. 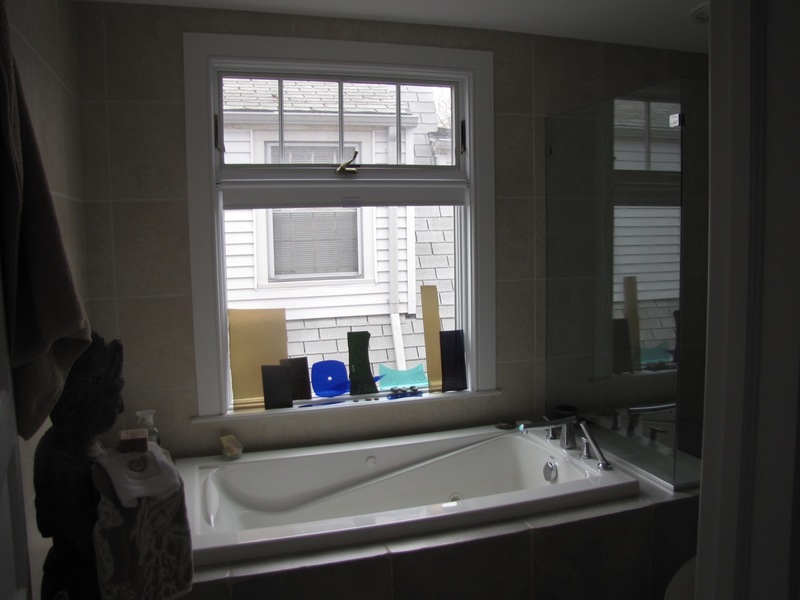 Since it was over the tub, privacy from the neighbor’s house next door was critical, yet we wanted light to come through. Eileen found the perfect choice–a pale teal semi-transparent textured glass. I’ll never forget the day she installed it, the beauty of it and the way it transformed the space took my breath away. 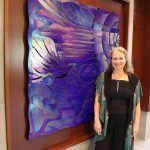 Rather than using lead around each piece as is traditionally done, Eileen glued and overlapped some of the pieces to create a more dimensional feeling. 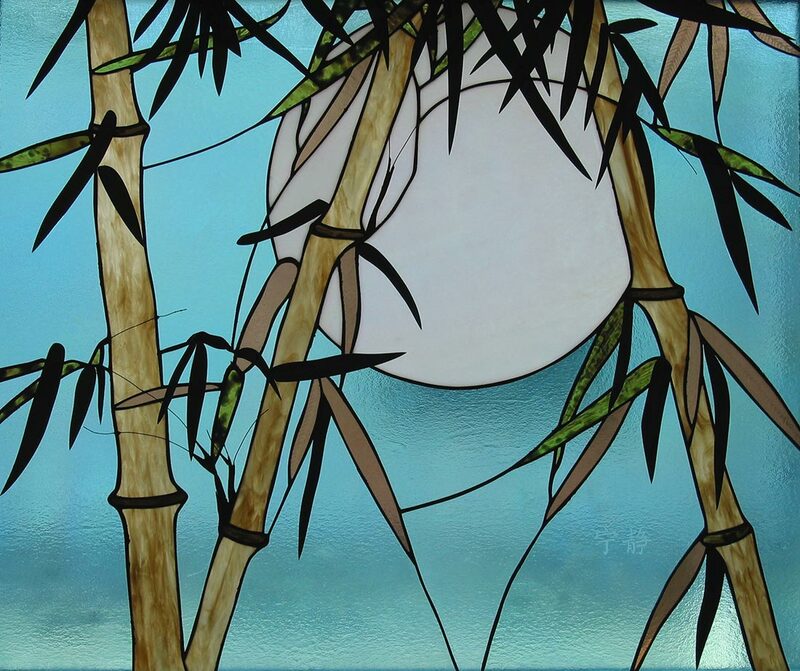 She also chose the perfect color and style of glass for the leaves and bamboo, successfully capturing the characteristic textures of the plants. The space at once became a prism of light, with bamboo images everywhere in the room. 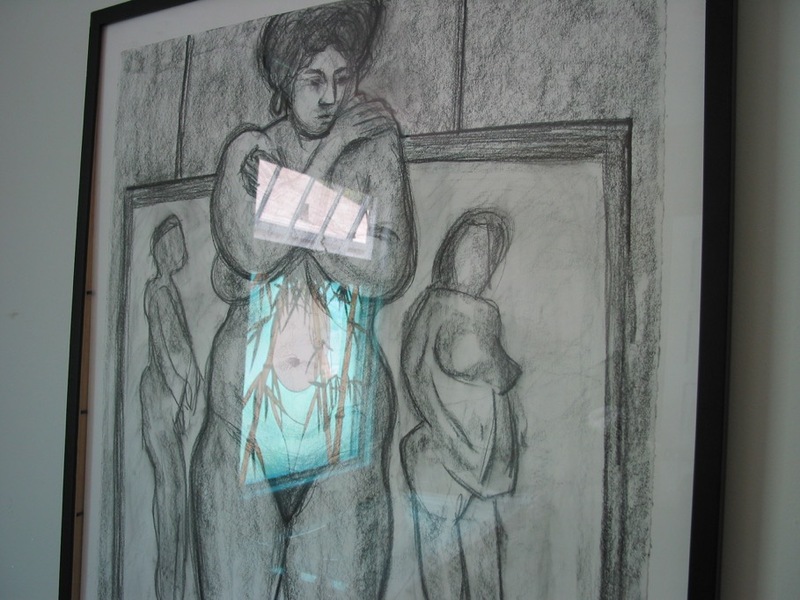 One reflection of the moon miraculously was reflected in the belly of the drawing of a pregnant woman hanging on the wall; another appeared on the glass of the shower; and a third hung suspended in mid-air between a circular mirror above the sink and the moon of the window. At night the window effect totally changes. 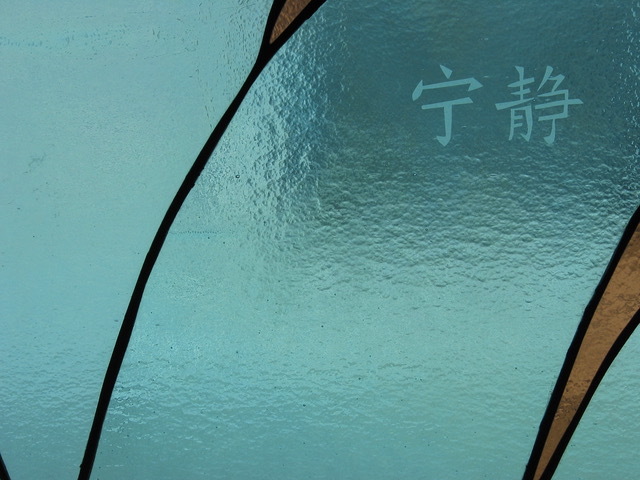 The glass glistens and shimmers, and ripples in the glass appear. The moon becomes a silvery white, and it almost seems that the room is bathed in moonlight. 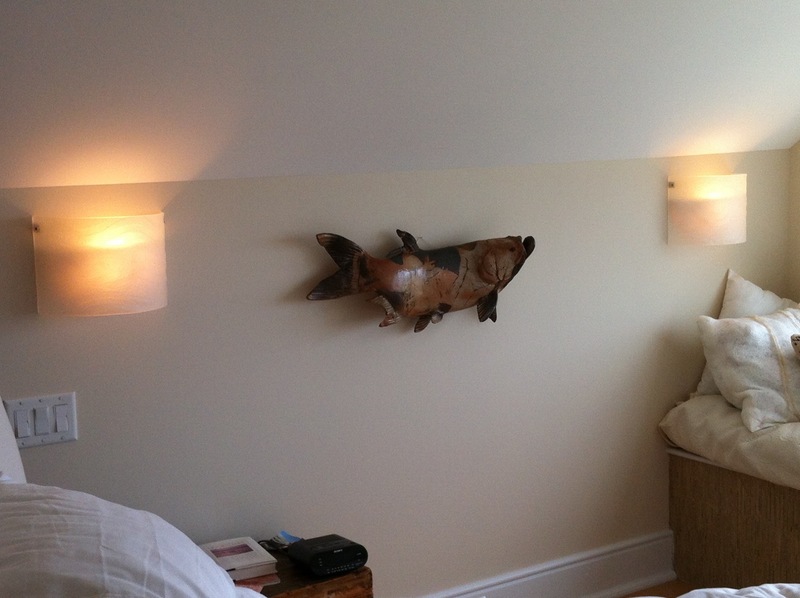 I was so happy with her work that I’ve commissioned her to do five wall sconces for my bedroom. Eileen was amazing to work with. At once she understood the sense of peace and serenity that I was trying to achieve in the master bath and in particular how I wanted it to feel.